Over two decades of experience serving fashion, beauty, celebrity and advertising clients worldwide. From as far back as Maureen can recall, she has been fascinated with beauty—and makeup in particular! So it comes as no surprise that early in her career she was engaged in the product development and launch of several very successful cosmetic lines including Vidal Sassoon, Matrix Treatment Cosmetics, and eventually her own signature line, M.Burke Maquillage. Most recently Maureen was contracted to develop, launch, and market the mineral makeup line, M. Vie, as their Brand Ambassador and Beauty Expert. Over the years, Maureen has remained committed to enhancing the natural beauty of an individual so they look and feel special without a sense of being overly “made-up”. Her philosophy: less really is more. Maureen is a highly sought after, well respected makeup artist. Over the years, she has worked with many top models and celebrity clients including Cameron Diaz, Pamela Anderson and Heidi Klum. 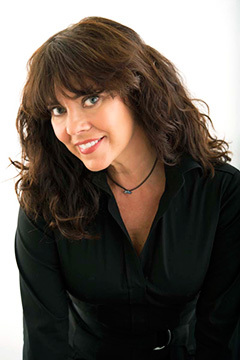 As Key Makeup Artist, Maureen led makeup teams for many commercials and music video projects working with top recording artists such as Red Hot Chili Peppers and Smashing Pumpkins, to world renowned athletes like Michael Jordan and Jackie Joyner-Kersey. She has worked with performers on a variety of television and award-winning engagements, including The Grammy’s, Oscars, Emmys, VMA's, CMA‘s, GMA, The Today Show, The Ellen Show, SNL and Conan O'Brien. Some of Maureen’s fashion and advertising clients include: Marie Claire, Allure, Glamour, St. John Knits, Target, Nike, LL Bean, Nordstrom, Roots Canada, Pendleton and Land’s End. She is well known among many top photographers and directors in the industry including Dayton Faris, David La Chappelle, Jeff Licata, Lisa Loftus, Norman Jean Roy, and Victor Skrebneski to mention a few. Maureen finds teaching and sharing her expertise extremely rewarding. Whether it’s a private lesson with an individual on how to apply their own makeup, educating an aspiring Pro MUA in a one-on-one session, or acting as a Platform Artist for a group seminar, it’s the experiences doing what she loves that are most fulfilling. Participating in other’s growth and nurturing individual’s transformations are personally and professionally invaluable for all involved. Her commitment to this mantra is evident in her work.